Home > Toys > Characters > Television > Yu-Gi-Oh! Last chance: We only have 12 left - This product will not be available again once our stock runs out. Basic Insect - Series 3 - 2"
Buy 1 for $4.88Buy 2 / Save $0.26!Buy 3 / Save $0.98! Size (inches): 4.92" X 1.97" X 6.50"
Meet Yugi, and his best buds, Joey, Tristan, and T�a. They share a love for the newest game that's sweeping the nation: Duel Monsters! Duel Monsters is a card-battling game in which players pit different mystical creatures against one another in wild, magical duels! Packed with awesome monsters and mighty spell-cards, Yugi and his friends are totally obsessed with the game. But there's more to this card game than meets the eye! Legend has it five thousand years ago, ancient Egyptian Pharaoahs used to play a magical game very similar to Duel Monsters. This ancient game involved magical ceremonies, which were used to foresee the future and ultimately, decide one's destiny. They called it the Shadow Game, and the main difference back then was that the monsters were all real! With so many magical spells and ferocious creatures on the earth, it wasn't long before the game got out of hand and threatened to destroy the entire world! Fortunately, a brave Pharaoh stepped in and averted this cataclysm with the help of seven powerful magical totems. Now, in present times, the game has been revived in the form of playing cards. Meanwhile, Yugi's grandfather gives Yugi an old Egyptian puzzle that no one can solve, but when Yugi finally pieces the puzzle together, his life is forever changed. The puzzle instifis Yugi with incredible powers, and ultimately creates his alter ego, Yami Yugi! Soon after, the mysterious creator of the Duel Monsters card game, Maximillion Pegasus, kidnaps Yugi's grandfather and Yugi is drawn into a Duel Monster's competition that Pegasus arranged. Now Yugi must duel his way through a tournament and defeat Pegasus in order to save his grandfather. 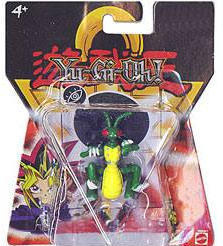 figures feature all the main characters in the mystical fantasy world of Yu-Gi-Oh! Colors and decorations may vary from those shown. Mammoth Graveyard - Series 3 - 2"
More Photographs - Basic Insect - Series 3 - 2"
End of More Photographs - Basic Insect - Series 3 - 2"